Cyrious permits the same variable to be used with different formulas in each product through its Variable Override feature available from the Product's Variable Listing. Go to thepricing_ch_03-productst containing the cfl_ch_5-variables you want to make specific for that Product. 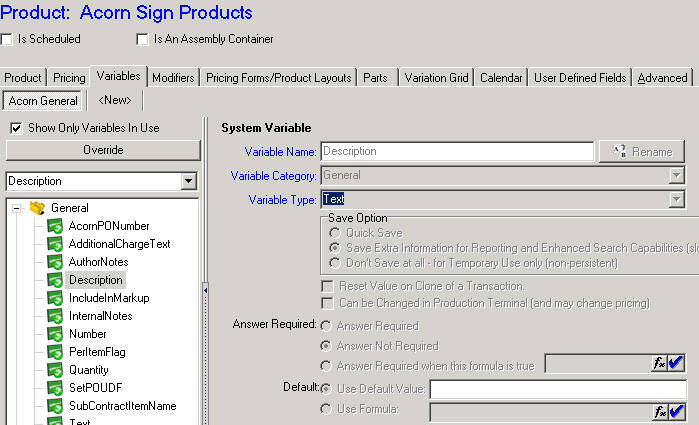 Click on the Variables Tab to bring up the list of Variables assigned to that product. Find and click the button labeled Override. Enter the formula for that Product and Save. We also recommend going to Setup/Pricing Setup/Variables and selecting the Variable you have overridden. Edit that Variable and in the Notes section write in the name of the Product where you have Overridden it with a note to that effect. That way you or others who may be editing the Variable's formula will know that any edits ro the Variable outside of the Products will not take effect for that Product.